Hey Everybody! I'm really excited about this site, so thank you for checking it out! I really enjoy what I'm doing & can't wait to see where it goes from here! I decided to start blogging for the site just to keep everyone updated on things I've been working on & possibly in the future a place I can offer free giveaways! So far, I've received two orders that I'm really excited about! The first is for a birthday party! 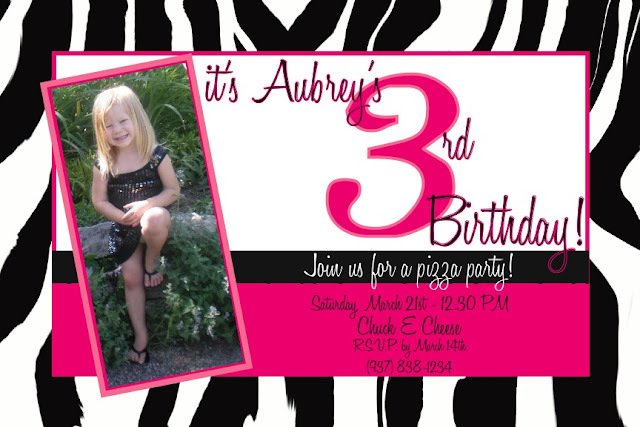 Aubrey Sue is turning 3 and her mom Linley asked me to design invitations for a pizza party! I think it's really cute, & Linley seemed to be pleased as well! *I change the numbers on all of my products to protect my clients! Well, that's all for now! I just thought I'd share with you my first client & product!